Today as you turn 33 weeks pregnant, you and your baby enter the final stage of development before the big debut. The baby still has to gain some weight while you are putting on kilos each day. You are now in the eighth month and there is just one more month to go. The baby today is as big as a pineapple and almost 17 inches tall and weighs around 1.8 kilograms. Normal birth weight tends to vary between 2.5 to 3 kg so the baby will gain around 1 kg in the remaining 7 weeks. Externally, the baby now looks like he/she will at the time of birth. Layers of fat pilling up are beginning to give him the plump look. The lanugo hair is gradually falling off and the hair is becoming visibly colored. The wrinkled appearance of the skin which you were worried about at 17 weeks pregnant or 18 weeks pregnant is totally gone. Most babies have scanty hair on the scalp at the time of birth but you could keep your fingers crossed as some cute little babies are born with a flock of hair. The hair growth continues from the day they are born. At this stage, the baby is surrounded by almost one liter of amniotic fluid. The amount of fluid is also an indirect indicator of the kidney function of the baby. 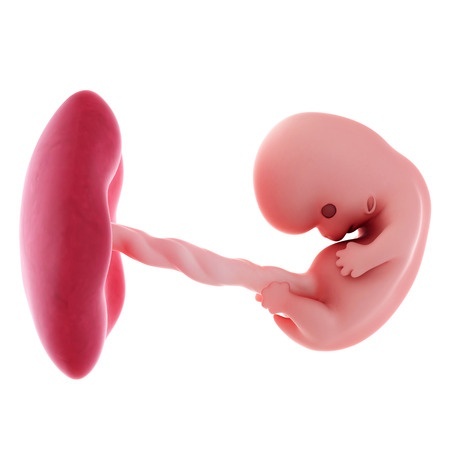 The kidneys are producing 500 ml of urine each day which is excreted into the amniotic fluid. 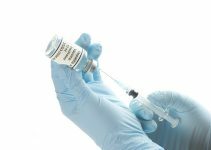 The baby’s immune system is forming as antibodies make their way from the maternal to fetal blood. Also the first milk that the baby receives after birth that is the colostrum is very rich in antibodies and provides the baby with much needed immunity that helps his little body fight back infections. The development in these last few weeks is very crucial for the baby. The major internal organs have completed forming. The lungs are working hard these days. The cells are forming a substance called surfactant to help the lung cells inflate completely after birth. At this stage, the lungs still cannot independently take in oxygen and throw out carbon-di-oxide. The early pregnancy symptoms like morning sickness are now gone, and your only concern is your increasing weight and the weight of your baby. With the pregnancy calculator showing only 7 weeks left, you are probably wondering about the total weight you will gain throughout the pregnancy. Most pregnant women gain 12-15 kg in these nine months. The weight gain depends on your hereditary tendencies and your pre-pregnancy weight too. If you are carrying twins, the weight gain in the third trimester will be around 1.5 pounds per week. With your tummy getting bigger each day, pressure on the bladder increases resulting in frequent trips to the loo. Anxiety about things ranging from baby growth to post birth management is a part of your everyday thoughts and sleep is definitely the last thing on your mind. Insomnia is very commonly seen in the third trimester of pregnancy. Also the fatigue and tiredness you felt at 10 weeks pregnant is back with a bang. Like earlier, it is wise to take the much deserved rest that your body is asking for right now. As you approach the last lap of your pregnancy, the body is preparing for child birth in multiple ways. The hormone relaxin is secreted which causes loosening up of the pelvic muscles and joints of the body which will help in easy labor. The upper border of the uterus can be felt 5 inches above your navel now. Due to crowding of the upper abdominal organs you will feel discomfort and breathlessness-more like a shortness of breath. All these symptoms will gradually reduce in intensity towards the last few weeks as engagement takes place (the baby drops down into the pelvis and the head gets fixed in the pelvis). This is a sign that the baby is ready to come out soon. This week onwards, as your body is preparing for child birth, you will feel more of muscular and joint pain symptoms due to the hormone relaxin. Here are some of the signs and symptoms of pregnancy this week. The baby can be seen moving his hands and legs actively but the limited space in the uterus makes the movements little restricted. 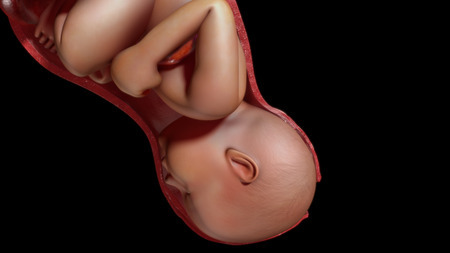 The 3D view of the baby at this stage is something you will cherish for a life time. Many clinics give a DVD recording of the examination for keeps. The placenta is checked for any abnormality like detachment or bleeding. The placental blood flow is checked and fetal heart rate is measured. Around this time, you will have been screened for gestational diabetes. The blood pressure will be monitored at each visit to keep a check on a condition called preeclampsia which can lead to pre term labor. Also the baby’s position-vertex/breech will be checked and the doctor will look for any loops of umbilical cord around the neck of the baby which could cause fetal distress. As your pregnant belly grows bigger, finding a comfortable position to sleep may get difficult. Lie down on your side with a pillow under the belly or between your legs for support. Do all your pregnancy exercises like kegel’s, mild stretching and yoga regularly to keep yourself active and fit. These exercises also help in early involution of the uterus after birth and prevent urinary incontinence. Include omega 3 fatty acid in your diet. It is seen that babies who had got a daily dose of DHA in their last trimester, had an edge in terms of early development especially of the brain and nervous system. The best dietary sources of DHA are walnuts, flax seeds, fish, salmon, shrimp etc. Drink lots of fluids as it will help to keep constipation away and also keep your skin more supple. Use a mild moisturizer to soothe the dry and itchy skin over the abdomen, thighs and breasts. Keep a track of fetal movements and see your doctor in case you notice a change in the numbers. Begin to stock up on the baby essentials like diapers, lotions, rash creams, bedding, clothes etc which you will need from the first hour of your baby’s arrival. Take your prenatal vitamins regularly.